Lagerstroemia are half hardy perennial shrubs. They reach from about 30 cm to 4 m in height, and bloom from the middle of summer until the first frost of winter. The shrub carries pink, white, or purple panicles. 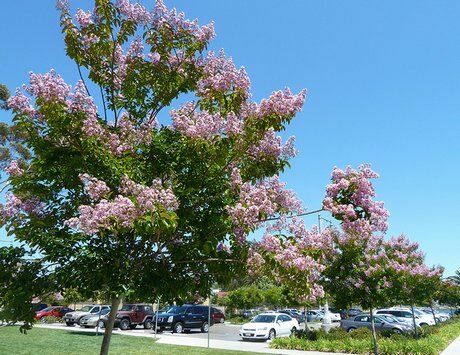 Some common names for Lagerstroemia include Crape Myrtle and Crape Myrtlette. Photographs: Crape myrtle by Wlcutler; Lagerstroemia indica by Takashi(aes256). Common Names: Crape Myrtle: Common; Japanese; Queen. Crepe Myrtle, Crape Myrtlette. Height: 12 to 144 inches (30 to 400 cm). Flowers: Middle of summer until first frost. Flower Details: White, purple, red, pink. Panicles. Long lasting. Sow Outside: Surface. Following the last frost. Spacing 12 to 24 inches (30 to 60 cm). Sow Inside: Germination time: two to three weeks. Temperature: 70 to 75°F (21 to 24°C) in the light. Seven or eight weeks in advance. Six or seven weeks before expected last frost. Transplant outdoors about three weeks after the last frost; temperature should not drop below 40°F (4°C). Requirements and care: Full sunlight. Rich fertile soil, moist soil. Regular watering to maintain moist soil. Provide a monthly feed during periods of growth. Spring prune. 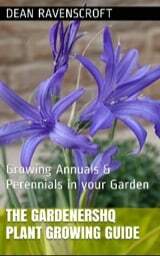 Propagate: by taking hardwood cuttings in the autumn. Miscellaneous: Attractive to many species of moths, especially those of the Endoclita genus. 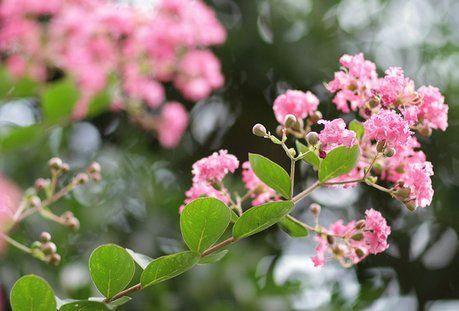 How to Grow Lagerstroemia indica (Crape Myrtle). If planning to grow Crape Myrtle and other Lagerstroemia from seeds outdoors then first sow on the soil surface in a sunny area of the garden following the last frost of spring. Ideally the soil that Crape Myrtle is grown in should be moist and of a fertile nature. If starting Lagerstroemia plants indoors then prepare about one and a half to two months before putting in the garden. They take from two to three weeks to germinate. The young Crape myrtle plants should be put out in the garden at about 30 to 50 cm (dwarf varieties) apart a few weeks after the last frost of spring. If you require more Lagerstroemia plants then cuttings can be took from the hardwood in the autumn. They are pretty easy to grow and look after, they should be fed monthly in periods of growth and the soil that they grow in should be kept moist.